It involves about 100 children from elementary class IV and V, and it takes place at the City Council Offices. Taxation affects the wealth of individuals, taking a part and allocating it to public spending. Decisions are made by the political authority which, to ensure revenue, makes use of collectors and, in order to organise expenditure, employs administrators. 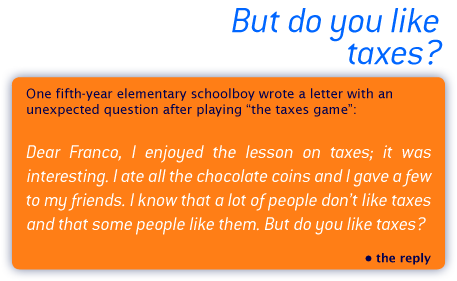 The children, who were not prepared and therefore are unaware of what will happen, come together in the hall of the City Council, and receive chocolate coins with which to pay the taxes, at random and in unequal amounts. Then, divided up according to their various roles they take their places: the Government, the tax collectors and administrators on the benches of the City Council, the citizens on the benches of the councillors. It is explained that a portion of the wealth will be used to pay taxes according to the decisions made by the Government. 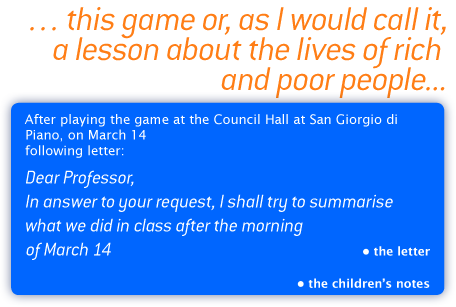 To this end, the children present their statements, setting out their wealth, the rate of taxation to be applied, the tax due, adding the date and their signature. Once the collectors have withdrawn their statements and received their revenues, the government compares what has been collected with what was due, making public, should it be necessary, any cases of tax evasion. For the tax dodgers the penalty is purely moral. At this point, the political authority allocates the amounts received to the various areas of spending: education, health, environment, security, defence, and social policies. The children thus see that individual sacrifice (taxation) allows the realisation of collective interests (public expenditure). They grasp that the way in which this is accomplished is that of ‘”imposed altruism” or “duty of solidarity.” The actions are followed and commented on by those who lead the game, so that the children are led to an understanding of what is happening before their eyes and of what they are taking part in. Great Hall of the "B. Mangino"
"Italo Calvino" and "Madre Maria Mazzarello"
"F.lli Ruffini" and "F. Aporti"